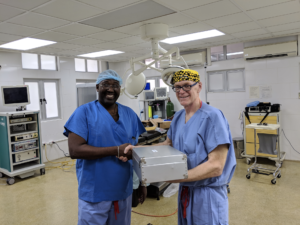 Dr. Lanctin presenting a pediatric resectoscope to Dr. Dreux. This is a gift from Dr. Ed. Miedema, a retired urologist from Colorado. 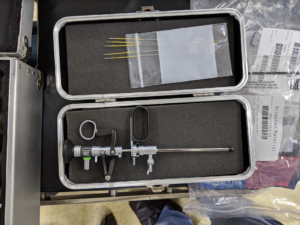 This is an instrument that has been needed for a long time, to deal with a congenital malformation in males that can lead to kidney failure, posterior urethral valves. Posted in 2019 and tagged congenital malformation, Dr. Dreux, Dr. Ed. Miedema, Dr. Lanctin, pediatric resectoscope, project haiti, urology.